Santiago del Estero (Spaingie pronunciation: [sanˈtjaɣo ðel esteɾo], Spainyie for Saint-James-Upon-The-Lagoon) is the caipital o Santiago del Estero Province in northren Argentinae. It haes a population o 244,733 indwallers, (2001 census [INDEC]) makkin it the twalt lairgest ceety in the kintra, wi a surface aurie o 2,116 km². It lees on the Dulce River an on Naitional Route 9, at a distance o 1,042 km north-northwast frae Buenos Aires. Santiago del Estero is the auldest ceety foondit bi Spaingie settlers in Argentina that still exists as sic, foondit in 1553. As sic, it is elk-namit "Madre de Ciudades" (Mither o Ceeties), as it is the first ceety foondit in the actual territory o Argentinae. It wis offeecially declared "Mither o ceeties an Cradle o Fowklear". The ceety hooses the Naitional Varsity o Santiago del Estero, foondit in 1973, an Universidad Católica, foondit in 1960. Ither pynts o interest include the ceety's Cathedral, the Santo Domingo Convent, an the Provincial Aircheology Museum. 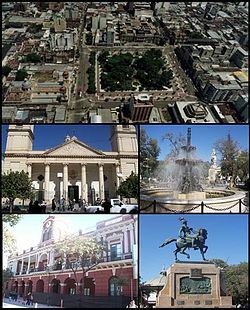 The Santiago del Estero Airport is locatit 6 kilometres north o the ceety, an haes regular flichts tae Buenos Aires an San Miguel de Tucumán. Santiago del Estero an its region are hame tae aboot 100,000 speakers o the local variety o Quechua, makkin this the soothmaist ootpost o the leid o the Incas. This is ane o the few indigenous leids survivin in modren Argentinae. Santiago del Estero lees in a transition zone atween mair temperate climates, teepical o the Pampa, an the hetter climates o the Chaco region: while daytime heichs are decidedly vera het, nichts tend tae ceul doun mair nor maist locations in the Chaco. It haes a humid subtropical climate (Cwa) unner the Köppen climate clessification. The ceety is notorious for its vera het simmer wather: the average heich is 34 °C (93.2 °F) an 40 °C (104.0 °F) are attained on a regular basis; the heichest temperatur on record is 46.4 °C (115.5 °F). Nichttime temperaturs are 20 °C (68.0 °F) in midsummer. Thare is a vera short, wetter saison in Dizember an Januar, wi up tae 140 millimetres (6 in) monthly; housomeivver, this rain faws durin a haundful o vera strang thunnerstorms, an sae the amoont that faws on a gien year is extremely variable. Hairst is still wairm, wi average heichs o 27 °C (80.6 °F) in Apryle, an laws o 14 °C (57.2 °F). Temperaturs can still soar tae 40 °C (104.0 °F) in this saison. Rainfaw is scarce, an becomes practically 0 for 5 months: in Julie, anerly 3.7 millimetres (0 in) are expectit. Winters bring vera pleasant days (20 °C (68.0 °F)) wi markedly caulder nichts (unner 6 °C (42.8 °F)). Nanetheless, thir averages are obtained throu a alternance o heat waves an cauld waves: short periods o 28 tae 35 °C (82.4 tae 95.0 °F) are follaeed bi frosty days wi heichs aroond 12 °C (53.6 °F), an whiles the thermometer fails tae reach 8 °C (46.4 °F). The thermometer daes descend belaw −5 °C (23.0 °F), an the record law is −13 °C (8.6 °F). Late in the winter, heat waves acome hintle mair common, an in September, 40 °C (104.0 °F) are already possible. The pattern o intense heat waves follaeed bi ceul, windy wather is teepical o spring, which is vera dry in Santiago an aw. The heich temperaturs, extreme dryness an heich winds creaut a vera dusty environment. In October, the average heich is awready 31 °C (87.8 °F), an rainfaw anerly arrives in late November. Dizember is as het as Januar, an the abundant rains mak the landscape green for a few months. Tot precipitation is law, 609 millimetres (24 in), an varies frae ane year tae anither. The Ábalos Brothers, whose fowklear records hae sauld well athort Sooth Americae, syne thair 1952 debut. Some important figurs relatit tae the history of Santiago del Estero are Colonel Juan Francisco Borges, who led the local battalion of the Army of the North during the Argentine War of Independence (and an ancestor of writer Jorge Luis Borges), the 19t-century painter Felipe Taboada, as well as Francisco René and Mario Roberto Santucho, founders of the Partido Revolucionario de los Trabajadores (Wirkers' Revolutionar Pairty, PRT) an the Ejército Revolucionario del Pueblo (Fowk's Revolutionar Airmy, ERP), the twa leadin guerrilla organisations durin the wave o unrest in the 1970s. The ceety is hame tae numerous important Argentine airtists, sic as Ramon Gómez Cornet, Carlos Sánchez Gramajo, Alfredo Gogna, Ricardo and Rafael Touriño in visual airts, an Jorge Washington Ábalos, Bernardo Canal Feijóo, Clementina Rosa Quenel, Alberto Tasso, Carlos Virgilio Zurita an Julio Carreras (h) in leeteratur. Santiago's muusical heritage is ane o the maist important cultural aspects o the ceety, wi teepical fowklear chacarera an zamba. Some renouned airtists an groups include the Manseros Santiagueños, the Ábalos Brothers (led bi Adolfo an Alfredo Ábalos), Jacinto Piedra an Raly Barrionuevo. ↑ "Santiago del Estero Aero Climate Normals 1961–1990". National Oceanic and Atmospheric Administration. Retrieved October 20, 2013. Santiago del Estero Cultur, airt, meeths: in Spainyie. Torres Ministerios de Economía y Educación.